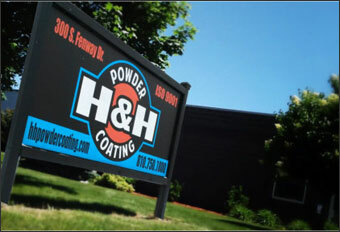 Powder Coating Fenton MI - H & H PowderCoating, Inc.
H & H PowderCoating, Inc.
H & H PowderCoating, Inc. is a dynamic small business driven to provide the utmost in quality powder coating, competitiveness and customer satisfaction. 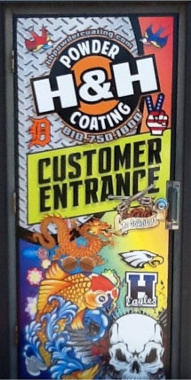 For over 10 years, H & H PowderCoating, Inc. has been serving the Southeastern Michigan area and beyond. If it can fit in the oven, we can powder coat it! Powder coating is the best, most durable method available for protecting your metal pieces, and unlike the painting process, it emits no volatile organic compounds (VOCs) into the atmosphere. Our oven size is 96″ x 96″ x 240″ (8 x 8 x 20). H & H PowderCoating is ISO 9001:2008 certified and is also a PACCAR Approved Vendor. We encourage you to contact us with your questions or to request a quote. Commercial and walk-in customers welcome!